I don't know were to begin with this stupefying exchange from Yahoo Answers. I didn't make this up. This is real. "Nick" asked: Why isn't Alaska count(ed) as the 51st state? Let me stop right here. A lot of teachers will say "There really are no stupid questions." But I'm here to tell you: THAT is a stupid question! 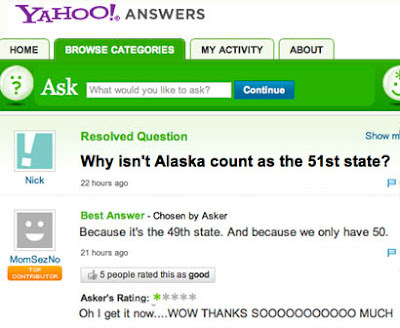 If Nick is old enough to spell "Alaska," he should know it's a state... and that the US has 50 of 'em. And if somehow he slept through social studies class every day of elementary school, then he should at least have the self-respect to look this up himself. Does Nick really have to involve other people in his quest for getting an answer to this question? What next from Nick? How come there has never been an African-American president? How many wheels does a bicycle have? or How do you spell "Nick"? Sigh. At least Nick is polite; I guess that counts for something. But he demonstrates the need for more geography in our schools.